Chapter 6: Reaching a recipe by technique and tinkering. Cognac ended up being a really good choice, and very little more was required besides mucking around with the proportions. I left the absinthe out, kept the Peychaud's in, traded the lemon twist for lemon juice, and held onto the kirschwasser as the star ingredient. I also added simple syrup, which deserves a story of its own. For a long time, I thought of simple syrup as existing for the primary purpose of making drinks sweeter. And I suppose that's technically true, but it's not the only thing it does in a cocktail, and in many cases it isn't the most noticeable or the most important. Given how long I've been at this and the whole scientific research thing, it surprises me that it took me so long to appreciate the other benefits of simple syrup. First of all, it affects the mouthfeel of the drink. Simple syrup adds viscosity, and it doesn't take a lot to make the drink as a whole feel richer and fuller-bodied. If you try using different concentrations of simple syrup (e.g., 2 parts sugar to 1 part water, instead of 1:1), you'll notice that the same volumes have different effects on the texture and feel of the drink. We often forget it, but cocktails are a tactile experience, too. Second, sweetness affects your perception of other flavors present in the recipe. There's a theory that your body interprets the sugar as a sign that this is good, calorie-dense food, heightening your awareness of things like, for instance, the fruity flavors of raisin and cherry in this drink. It also seems to round out sourness, which may be why we add sugar to drinks that use citrus juice. We don't have a perfect, complete map of the changes in perceived flavor due to added sugar (at least, not that I know of), but if you find yourself working on a recipe that seems to be just a little bit off, and you aren't sure what's the matter, try adding a quarter of an ounce of simple syrup and see if that improves it. That was the technique I used, and it paid off so well I ended up doubling it. After some tinkering with the other proportions, I settled on a recipe I was very happy with. The color ends up being a warm, slightly red- or orange-tinted amber, reminiscent of the old streetlights with sodium bulbs. That tipped the scales, and the drink officially became the Nightglow. Shake all ingredients with ice. Strain into a chilled coupe glass and serve. I designed this using Courvoisier, which is my go-to cocktail Cognac and makes this a damn fine drink. Most of the Cognacs you'll come across can be substituted for one another, but I find that Hennessy has a harsh overtone and too much wood, and so I try to avoid using it unless the recipe specifically benefits from those elements. That's all for this series! If you've got a reason to commission a cocktail recipe from me - whether it's for an important person in your life, a special occasion, or the hell of it - this is the kind of process I'll go through to make it. Email info@herzogcocktailschool.com if you'd like one of your very own! Chapter 5: Trusting your gut, even when your gut gives you every reason not to. If I've learned anything from creative pursuits - cocktails, writing, or otherwise - it's that you have to listen to your instincts. They'll be wrong occasionally (or often, when you're trying something new), and that's OK. That's how you learn. Best of all, sometimes your gut will tell you something that sounds bizarre but works on some deeper level. No matter how nicely bitter, herbal flavors contrast with pineapple, the Jungle Bird must still have seemed ridiculous the first time it was tried, because what kind of nut puts Campari in a tiki drink? You miss opportunities like that if you become dismissive of your own ideas. It's an easy trap to fall into, especially when you know other people have been doing something longer than you, or do it better than you. This is why a lot of authors practice spontaneous writing: if you do it right, you're too busy writing to think about all the ways in which the writing is bad, which frees you to actually write. You can edit later, when you actually have something written. Given how poorly this has gone so far, it's weird that I thought it would work at all, let alone through so much tinkering. Maybe I should can the whole thing and look to a different poem for inspiration. Wait this drink might actually work with Cognac. In retrospect, I can tell you exactly why the Cognac worked. The subtle wood and strong fruit flavor (raisin, in this case) complement the plantiness and the cherry of the kirschwasser. There are no distracting savory or evergreen notes. It doesn't have the oiliness of gin, which was causing textural problems I didn't even get into before. And the warm, rich lactones of an aged spirit base gave the cocktail a depth that could support everything else. But that wasn't a conscious thought process at the time. "Cognac!" popped into my head, and I went with it. I knew that even if my judgment was compromised that day, at least this would turn out badly in a different way, which was enough for me to give my mind's palate the benefit of the doubt. I want to save the big reveal for next week, but I did promise you a recipe. Since this week brought us back around to Cognac, and we'll spend some of next week on the importance of simple syrup, I'll leave you today with a cocktail that uses both extremely well: Joaquín Simó's Sidecar. Shake with ice. Strain into a chilled cocktail glass and garnish with an orange peel (or not at all). Stay tuned for next week's post, "Chapter 6: Reaching a recipe by technique and tinkering." Chapter 3: What's in a name? The fact that alcohol's effects on us are at once so familiar and so inscrutable is probably responsible for this. We talk about distilled spirits the way that our ancestors talked about actual spirits: a grandparent might have a long and close relationship with one, or a friend might not get along with another, and we talk about the capricious and distinct effects each one has on us when they take over our bodies, and the fact that none of the details are consistent from person to person doesn't affect our certainty in the slightest. Of course we name our drinks to offer meaning without understanding. I have always found it easier to fit a recipe to an existing name than vice-versa. Like my poet friend, I find constraints to be creatively useful, and the puzzle of creating a drink that's relevant to its title is often more fun than trying to create something ex nihilo. Fortunately, poetry shares the tendency of cocktail nomenclature to connote without denoting, which makes a book of poems a good place to start when naming a drink. A few of the titles jumped out at me, particularly "Magnetic North" and "Nightglow," and the partial title "Trackless Trailhead." And there were individual lines tempted me, too: "Slowly Turning Galaxy," "Roiling Gray Haze," "Breaststroke Kirschwasser Wavelengths." Kirschwasser being a favorite accent ingredient of mine and actually mentioned by name, I decided it had to be incorporated, and considered naming the drink either the Kirschwasser Wavelength or the Nightglow, after the poem in which it appeared. There are certain cocktail ingredients that manage to feel like they're supposed to be part of one's bar without having many (or any) classic recipes that call for them specifically. Dubonnet is one, a fortified wine that you rarely need in practice unless the Dubonnet Cocktail is your thing. Kirschwasser is another - an unfortunate thing, given what a wonderful ingredient it is, but even the best drinks that call for it have faded into relative obscurity over time. Like me, David Wondrich is a fan of kirsch, and particularly of the Rose, a 1920s cocktail known to us today almost entirely because of him. It's delicious, it's low-proof, and has a lovely soft pink color. If you're observing Lent, you might want to keep it in mind for Laetare Sunday (and if you're not, you might want to keep it in mind for breakfast). Optionally, garnish with a maraschino cherry. Stay tuned for next week's post, "Chapter 4: Taking stock. Now what have we got?" I do enjoy a good recipe challenge. I've had a few friends ask me to come up with signature recipes for special occasions, particularly weddings. It manages to be a nice and very personal alternative to a traditional wedding present - as well as a lasting one, because I give them the recipe. Recently, a friend of mine quietly published a book of poetry. It's called Abacus, and you can buy or download it here; doing so may help you understand the rest of this post. I'm always happy to see people produce interesting writing, particularly when they're people I know, and this is an interesting volume: every poem is constrained in some way beyond the verse form. If you're familiar with Gadsby, the novel written without the use of the letter "e", that's the sort of thing going on in each poem, except that doing without a single letter is much easier in a poem than it is in a novel, and so the constraints Luke has chosen for his poetry tend to be stricter. In any case, we had a launch party for his book, and I was placed in charge of the signature drink. Because I occasionally get asked how I go about inventing a new cocktail, I thought it might be interesting for fans of the blog to see my thought process for this one described in depth, particularly because, in this case, it turned out poorly before it turned out well. This is a somewhat long story, so I've broken it up into six pieces, each of which will be a separate post and conclude with a recipe. Chapter One: What goes into an artist's cocktail? Ingredients and cocktail styles often acquire associations over time. 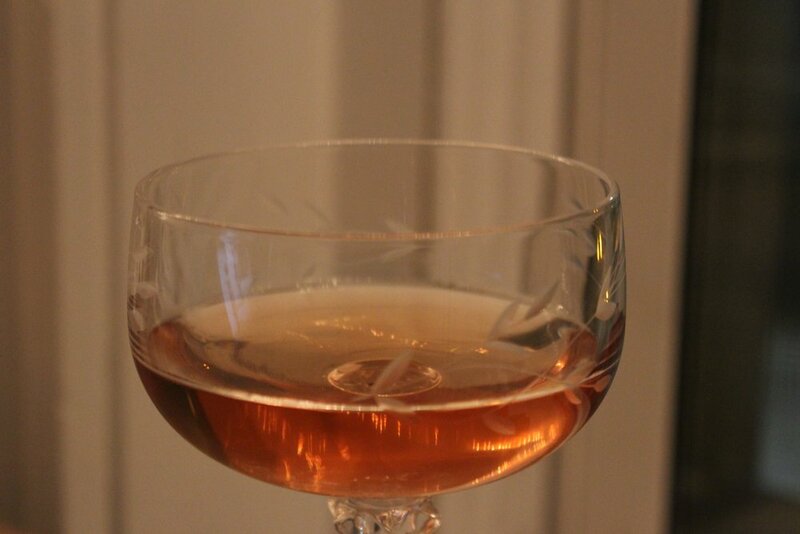 If you wanted a drink to evoke New Orleans, you would probably use Peychaud's bitters. For Vermont, you'd reach for the bottle of maple syrup. Dozens of bars have played with the Jungle Bird's rum-bitters-pineapple formula and put the results on their menus with avian names. If the cocktail's name has "revive" or "reviver" in it, you can bet it's a variation on the Corpse Reviver #2 (not even on the less popular Corpse Reviver #1); if it has "Word," odds are it's a Last Word riff. And if you call something a "Julep," people are expecting mint and thinking of Dixie, even though the word got its start in the Middle East talking about rosewater. More than any other spirit, absinthe says "art." It has a tradition of being taken to spur creativity, whether by hallucination or mere ordinary intoxication. It calls to mind the Bohemian era in Paris, when liberally quaffed by poets and painters and occasionally their patrons. Even the experience of drinking it is aesthetic, ritualistic, transformational. An artist's drink if ever there was one. As if to prove my point, Henri de Toulouse-Lautrec somewhat famously invented a cocktail using absinthe, which he called the Earthquake ("Tremblement de Terre" in French, which, let's be honest, is a much cooler name). It consisted of three parts Cognac, three parts absinthe, and a glass. What I love about this is that it doesn't matter what you use to measure your ingredients. It could be a jigger, a punch bowl, or your left shoe, and Lautrec will still insist that you fill it three times with each one. I've served a less earthshaking version at events in the past, and it is delicious. It's essentially a glass of Cognac with a quarter-ounce of absinthe stirred in and a lemon twist. Not unlike a Sazerac. And that became my jumping-off point. Combine in a rocks glass and stir without ice. Rim the glass with a lemon peel, twist it over the cocktail, then discard. Stay tuned for next week's post, "Step 2: What goes into this artist's cocktail?"